We are interpreting the log files visually. In the preceding tutorials we have customized the Apache log format and performed a variety of statistical analyses. But we have yet to graphically display the numbers obtained. The visualization of data does in fact provide a big help in identifying problems. In particular, time series are very informative and even performance problems can be better quantified and narrowed down visually. But graphical display can also provide interesting information about false positives among the volumes of ModSecurity alarms. The benefit of visualization is readily apparent and is a good reason why graphs have always been an important component of dashboards and regular reports. However, in this tutorial we will not be aiming for perfectly laid out graphs that management would like. We instead want to get highly informative graphs showing the essential parts of data by the simplest of means possible. For this reason, we will be using a little-known feature of gnuplot. The gnuplot package; e.g. as present in the Ubuntu distribution. The appearance of entries in log files follows a chronological sequence. However, it is actually relatively difficult to follow this chronological sequence in the text file. Visualization of the log files is the answer. Dashboards have already been mentioned and a variety of commercial products and open source projects have become established in the past few years. These tools are very useful. But they are not always easily accessible or the log data must first be imported and sometimes even converted or indexed. There is thus a big gap in displaying graphs in the shell. The graphical tool gnuplot can in fact do this in ASCII and be controlled completely from the command line. 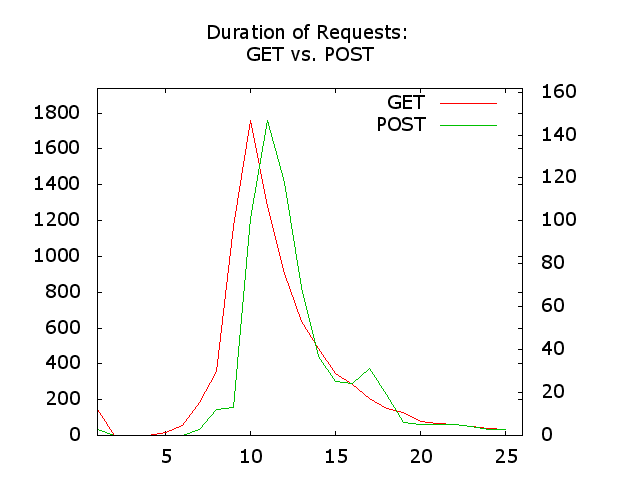 Let’s generate a simple graph in which the number of requests per hour is presented on a time line. As an example, to do this we are using the access log that we became familiar with while fine tuning ModSecurity false positives in one of the preceding tutorials: tutorial-8-example-access.log. Each of these lines represents a request. The number of requests per unit of time can thus be easily determined by counting them. Totaling by hour can be easily done by cutting the timestamp at the colon and adding them up via uniq -c. Just to be safe, we’ll insert a sort since the log files are not necessarily in chronological order (the entry follows the completion of the request, but the timestamp indicates the receipt of the request line in the request. This means that a "slower" request at 12:59 may appear in the log file after a "fast" request at 13:00. We can already see this problem at 12:54:58 and 12:54:59 above). In this rudimentary graphical display we see the number of requests on the y-axis. The timeline is on the x-axis. Peak load is approx. 250 requests per hour. In general, we see the volume of traffic going strongly up and down. At the top right we see the legend which by default the asterisks describe as Col 1. A serious drawback is the useless labeling on the x-axis, since the numbers from 20 to 120 only indicate the line number of the value on the y-axis. But because we had gaps in the dataset our data is based on, we can no longer infer the time of a value from the number of lines and hence the x-axis in the graph. We’ll first have to close these gaps, then have a closer look at the x-axis problem. The problem with the gaps is that for some hours we don’t have a single request in the log file. The log file comes from a server with relatively little traffic. But filtering the log file after an error on a server with significantly more traffic results in gaps appearing in the timeline. We have to close them for good. Up to now we have extracted the date and time from the log file. The approach has proven to be inadequate: Instead of deriving the sequence of dates and hours from the log file, we will be rebuilding it ourselves and looking for the number of requests in the log file for every date and hour combination. A repetitive grep on the same log file would be a bit inefficient, but entirely suitable for the size of the log file in this case. The approach must be optimized for larger files. We thus read the combined date-hour string in a while loop. We then count the number of requests for each of the strings (via grep -c here) and then output the result along with the date-hour string. This gives us the same result as in the previous example, but this time the gaps are filled in. Let’s put this output into our graph script. There now appears to be a degree of regularity, because every 24 values is an entire day. Knowing this, we see the daily rhythm, can surmise Saturday and Sunday and may even see indications of a specific lunch break. We are getting closer to the goal. What’s still problematic is that the date-hour combination is wrapped at the hyphen and the hours are completely missing. If we replace the hyphen, this wrapping will no longer occur. Let's have sed help us out. Now only the hours are still not visible. As can be seen further above, they are separated by a space from the date. If we replace this space by a hyphen then be get a word wrap between the date and the hour. We can use a number value after a slash to shift the labeled value to the left or right. Whole positive and negative values are allowed for this. This gives use the desired graph. One detail are the many plus signs in the top and bottom borders of the graph. They are related to the large number of (hidden) labels and disrupt the picture a bit. I will try to suppress them in a future version of this tutorial. -c  --columnnames STR     Name for columns. Separate by ';'. before the plot directive. Separate commands with semicolon. -L  --logscale            Logarithmic scale. Default is normal scale. every tics gets a label. Arbigraph will graph the first column. Subsequent columns are ignored. The X-axis is actually the line number of a value. starting point of the line numbering. is put in the top left corner. You can align it to the right by adding "(right)"
printed. The other ones are hidden. behind a slash. Negative values are ok.
right or to the left until you find something that suits the data and the graph. The transformed data file /tmp/arbigXBwhcT.data is left for future use. We can copy the script into a text file and pass it to gnuplot as STDIN. This works because the data file which arbigraph wrote for gnuplot in gnuplot data format was saved for further use (/tmp/arbigXBwhcT.data in this case). Provided you have sufficient expertise in using gnuplot, you can now carry on and generate a "report-ready" graph. Besides time series, our arbigraph combined with gnuplot can also visually render the distribution of values. Let’s look for example at the duration value documented in the different requests. What we find here is on the order of 1 million microseconds. How does that look statistically (we are still familiar with the routines from earlier tutorials)? This is apparently a slow application and there are also a lot of outliers towards the top. We used the command above to replace the blocks with lines and used a logarithmic scale, because the outliers were optically too dominant. The graph is however not really satisfactory. The reason is the excessive number of data points. Our terminal has only 80, 120 or, in extreme cases, 200 columns. This is of course too few for a set with 10,000 points, which is why gnuplot itself transfers the graph in relatively few data series. Outliers are centered and smoothed out. Then comes the familiar problem with the badly labeled x-axis. What we are lacking is a method called binning in statistics. The term binning means summarizing data series into a group. A typical example is a statistic that states that of 20-29 year-olds 45% blah blah and of 30-39 year-olds only 28% blah blah. For 40-40 year-olds... The bins here are the 10-year age groups. The width of the bin can be freely chosen and the content of the bin is then a compilation of the values. In our case, we subdivide the durations of requests into individual bins and for each bin count how many requests there were in this group or this bin. There is a tool available for performing this binning process: do-binning.rb. This looks a lot better. We feed this result into the graph script (and clarify right off that we don’t want to have each value labeled); we saw how this works above. This works and gives us a good view of the distribution of the durations of the different requests. We apparently have a peak at approximately one second and then comes a leveling out afterwards. What may be of interest how the small cluster of very fast requests on the left looks like. Let’s do something new: Can we have GET and POST requests placed side-by-side and do we see a difference? We are now working with two separate data files, which we separate via the paste Unix command. Afterwards we use awk and tab to get the labels into the data and to remove the label repeated in the third column of data. The display of two values no longer works in blocking mode, which is why we are again relying on lines. The two lines are drawn over each over on differing scales. This enables a good comparison. Less surprisingly, POST requests take a bit longer. What is surprising is that they last so little longer that the GET requests. arbigraph adapts to the width of the terminal for output. If it should be narrower, this can be controlled via the --width option. Similarly, the height can be adjusted via --height. Export as a PNG image is also included in the script. Export is still rather rudimentary, but the resulting images may be good enough to use in a report. Plot written to file /tmp/duration-get-vs-post.png.